It seems like the weekend is over again. This one was very busy for me, not only because of the 14th months old Zuuu and all the staff I wanted to do because of the usual weekend. Here, on the Blog, perhaps it looks like I had two days off from posts and the Passion of mine, but in fact it is totally different! However I didn't write even a tiny part of a post, I did a lot of searching, digging, thinking - of what to do and how to do it to make this Blog a nice place for everyone, not just me. I hope in few days, or maybe a bit later, I will show you a part of this conceptual work I did this weekend, while the rest of it will remain my mystery :-) Oh, you can't even imagine - and couldn't have I before, how much labourious it is to have a blog. Today I want to show you a piece of work I made for wedding receptions - one by my own, and the other with my friend Sokół - the srcapbooking artist! The beginnig was obviously made due to Sokół's order - as it was a wedding table plan made for her wedding. She comes from the Mazury region in northern Poland and the wedding was supposed to take place over there - at the lake. The nautical stile was adjusted to the nature of Mazury and the hotel where it was organized - Wrota Mazur, which is was really gorgeous. And beacuse it was nautical theme, it was quite easy for me to pick the elements for the table plan. It was marine blue, red and lots of stripes, along with blue and red ribbons. The table was done on the base of IKEA white frame with the marine blue cardstock. Oh! And that was the moment I've decided to invest in a guillotine, so that the table cards look perfectly straight. The second wedding table plan was made by us together - and this time it was an order from a friend of our friend, Asia. It was the time when the little Zuuu was on the world already, so I've decided to accept the challenge but only under condition that Sokół will accept it too and we make it together. 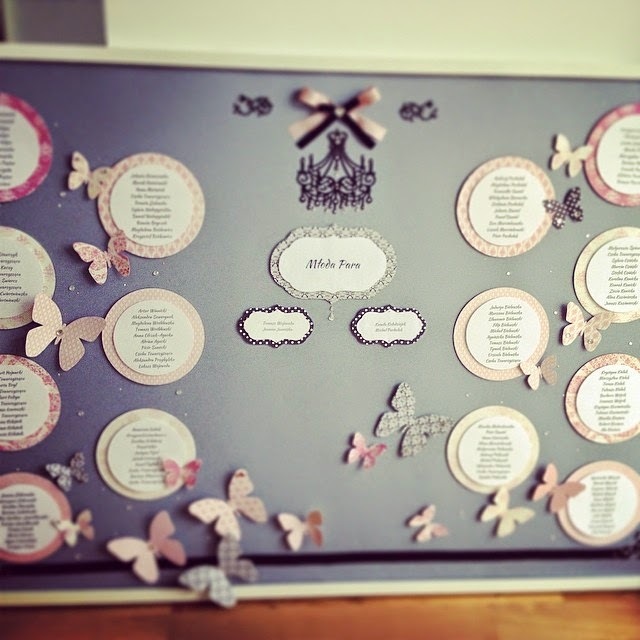 The only request from the bride was to make the table plan with a hint of pink and in a glamour style. Afterall I must admit Sokół did a lot of a good job, not only figuring out how to make it sooo pretty, but also taking care on colours, shapes and everything loking nice together. Have a look, how brilliant it was! Anyone else would like to have a nice wedding table plan? Go ahead! We love challenges! Frankly speaking the butterfly table plan I admire much more than the nautical one, but everything is just a matter of sense. What do you think?